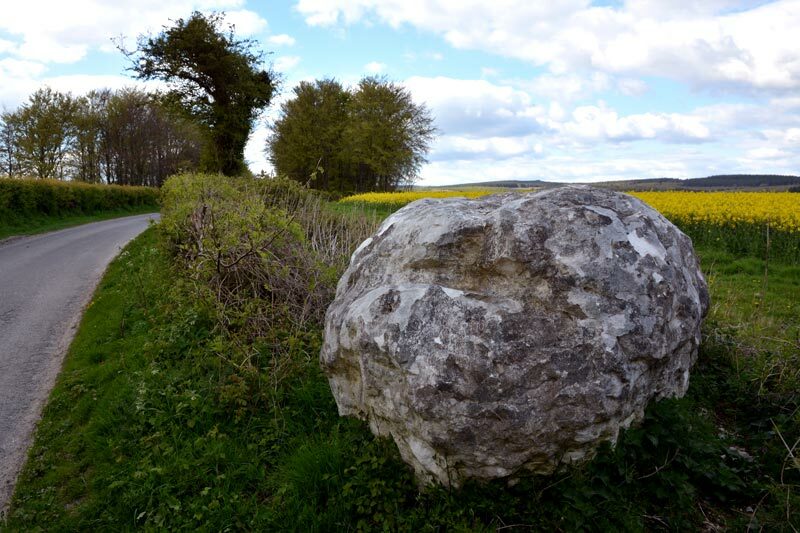 It’s a wonderful walk in its own right and the giant chalk balls made it even more enjoyable. It’s a walk with a built-in Easter Egg Hunt that can be enjoyed at any time of the year! 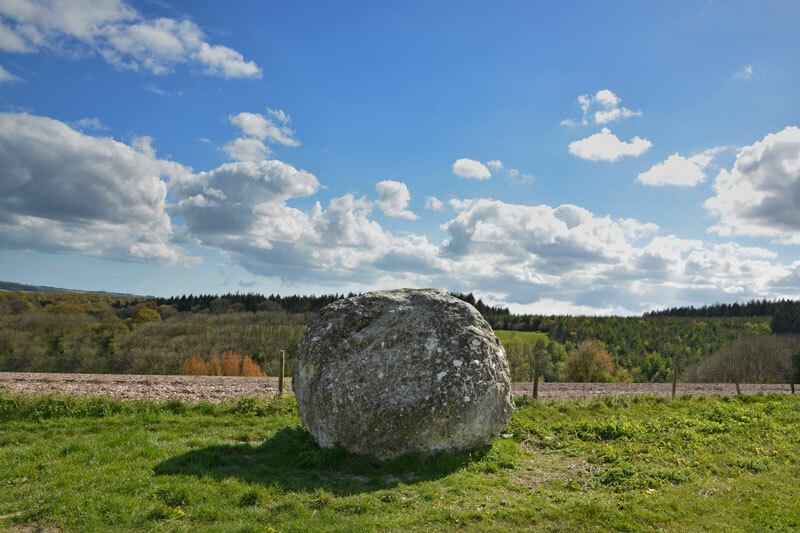 The Chalk Stone Trail was installed in 2002 and consists of 14 chalk stones carved from chalk quarried at nearby Duncton Quarry. 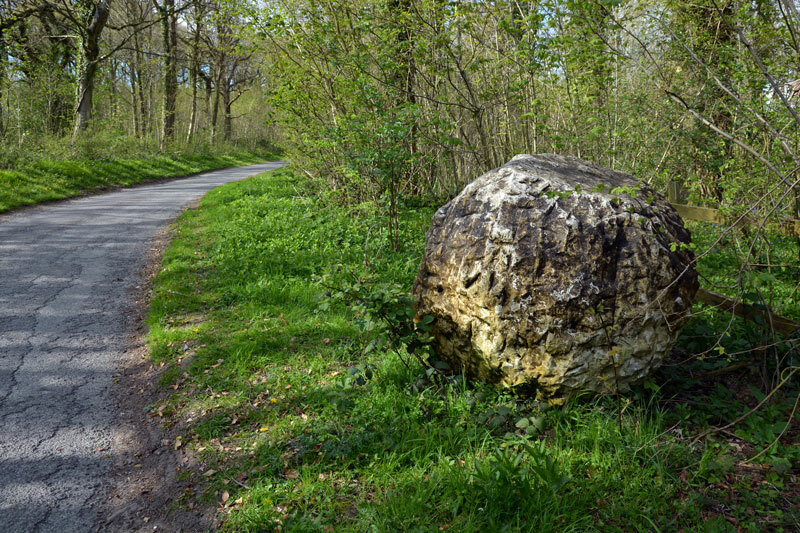 Andy Goldsworthy is an environmental artist and he expected the stones to disintegrate quickly over the space of a few years. I’m pleased to say the sculptures are still there though some of them are starting to decay. 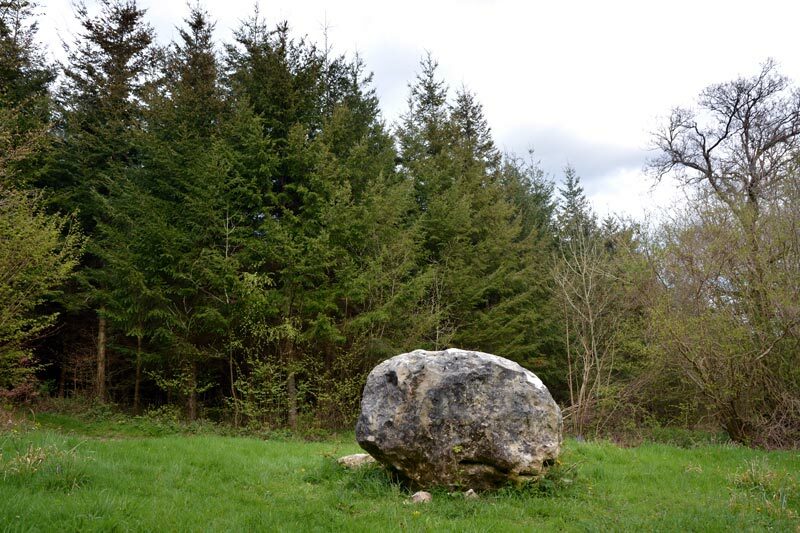 The stones range from 2 to 3 metres across and the heaviest weighs 14 tonnes. Some of them are quite overgrown and despite their size quite hard to find. The walk starts at the top of Cocking Down on The South Downs Way. 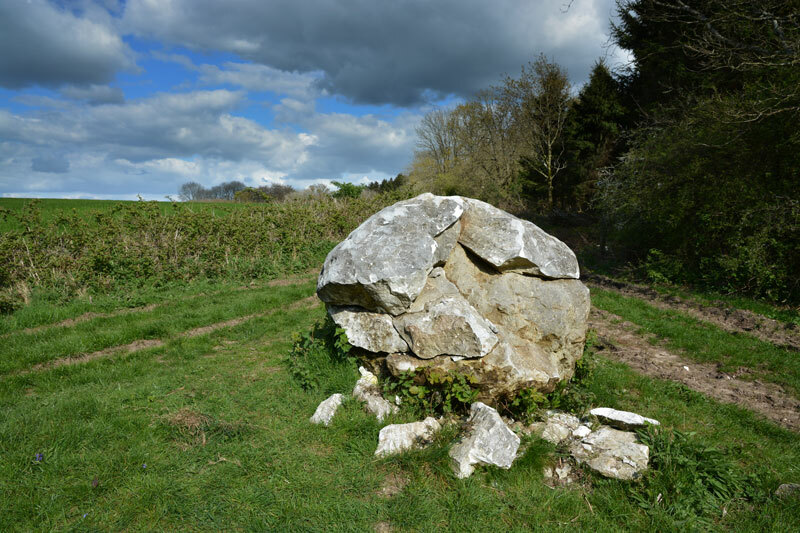 You can reach the first stone from either Bepton or from Cocking Causeway. There’s plenty of parking at Bepton and Cocking Causeway. The walk ends opposite the gates to West Dean College, with parking just down the road in the village of West Dean. The No 60 bus stops at Cocking Causeway and West Dean which is handy for walkers leaving a car at the start of the trail. Stone 1 of the Chalk Stones Trail is about 3/4 mile along The South Downs Way from Cocking Causeway. You can’t miss it! Fork left from The South Downs Way at Stone 1. After another half a mile you’ll reach Stone 2. 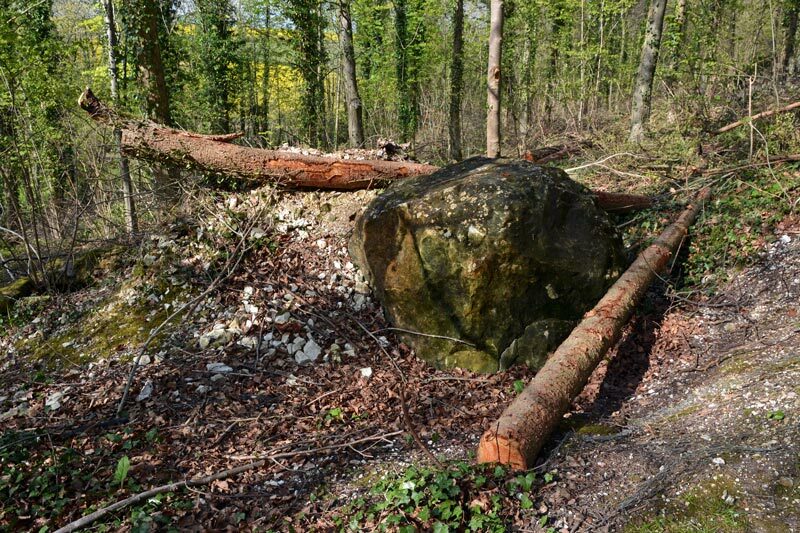 This stone is definitely suffering from the weather… Carry on along the track but bear left after a 100 yards or so. A little further along the path you’ll come across a forestry track. Chalk Stone number 3 is on your right. Head straight across the track and down the path into the woods. I confess I’m missing a photo of Stone number 4! Must sort this out! The trouble is that Stone 4 is a tough one to find. 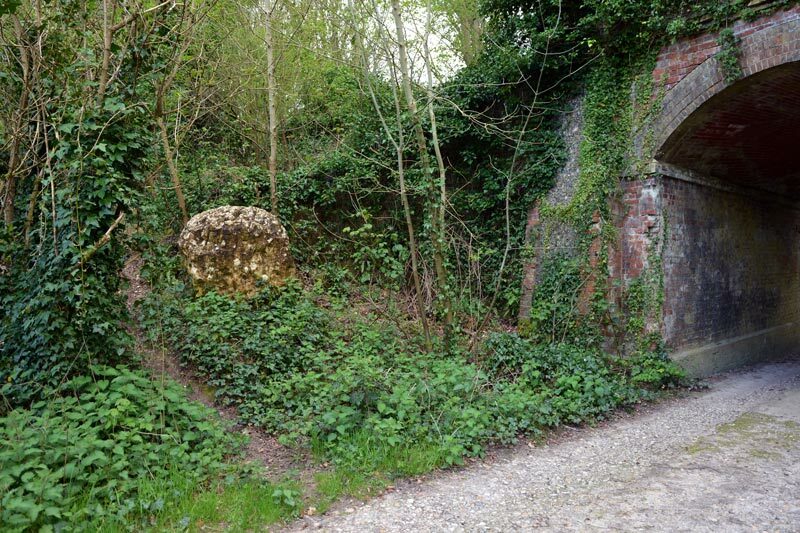 After passing a ruin in the woods on your right Stone 4 is in a dip as you arrive at the next track. Keep your eyes peeled… Then turn left at the track through a conifer plantation. Stone 5 is another 250 yards on the left. It’s absolutely massive though I’ve known people to walk straight past it! 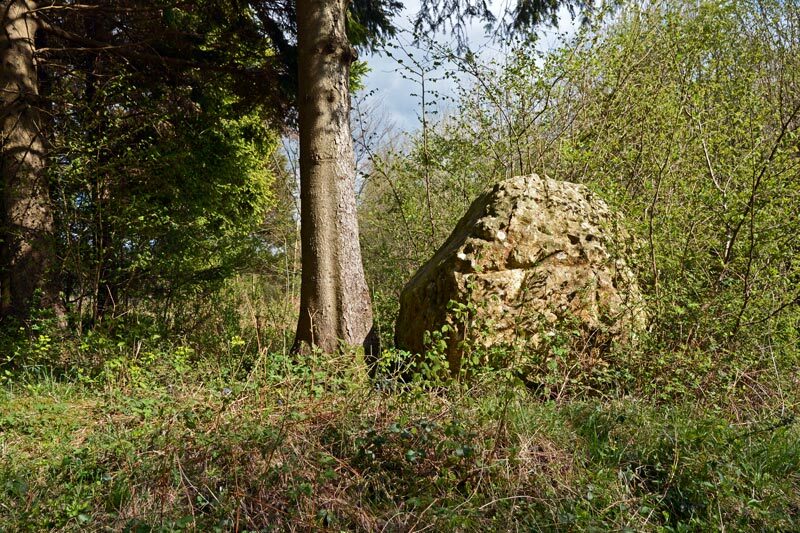 The next stone on the Chalk Stone Trail is in a grassy opening in the woods. You can’t see it from this photo but the stone has split into two parts. This clearing in the woods is wonderful in March – it’s filled with wild daffodils and well wort a visit. The next stone is also easy to miss! The chalk has turned a greeny-brown colour and blends in with the hedgerow. 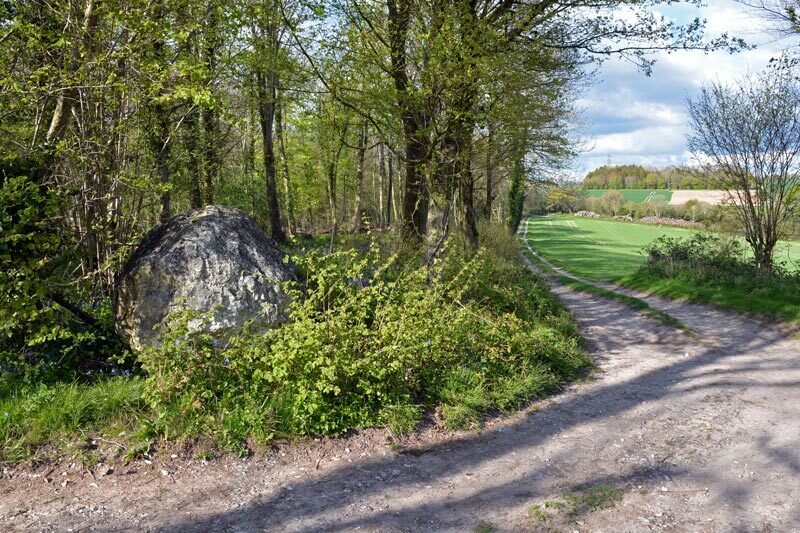 Continue along the path and turn left when you reach a tarmac lane. The tarmac lane soon turns left and you’ll see a massive stone right in front of you. Follow the track to the right of the stone. The path soon arrives at another lane. Your next stone is right in front of you. Turn right onto the lane and keep going. The lane turns into a long tree-lined roadway which is the route to Monkton House from West Dean. 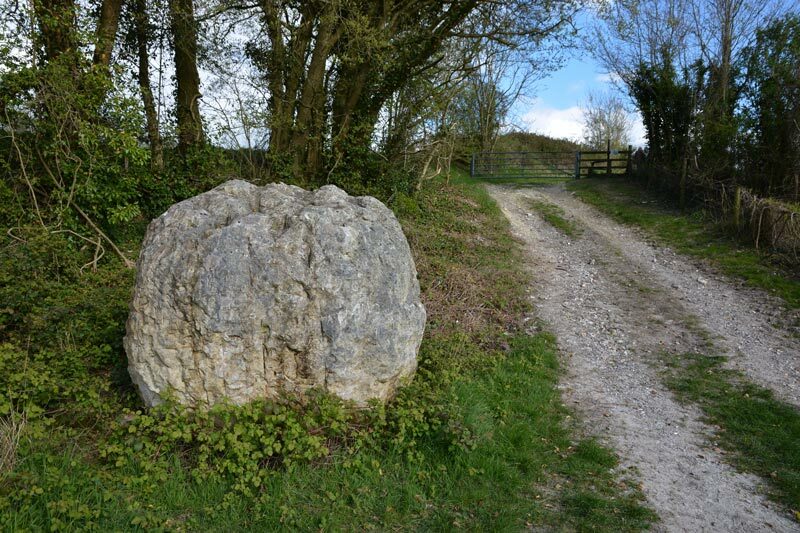 Your next stone is on the left as you walk along the road. Keep going – not long to go! 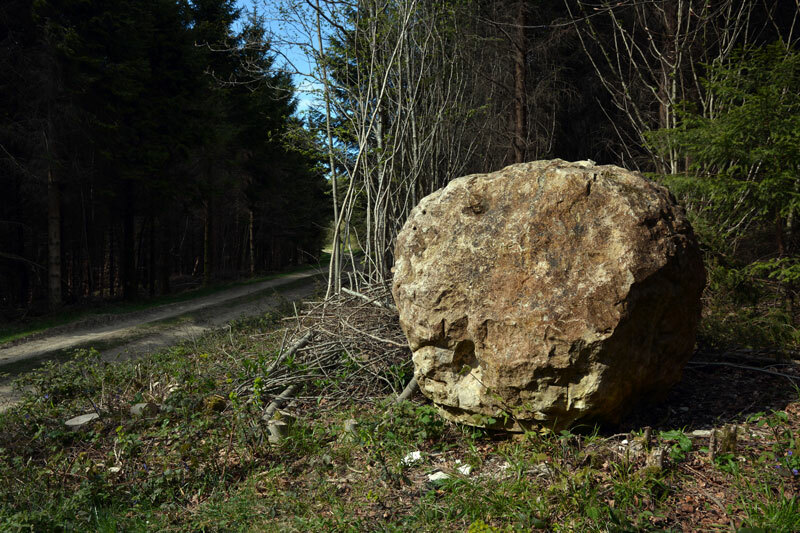 You’ll see your next stone on the left as you start to head downhill. Keep going now, passing some cottages on your left then turn up into the woods on your left after the houses. Follow the track – it’s quite steep. 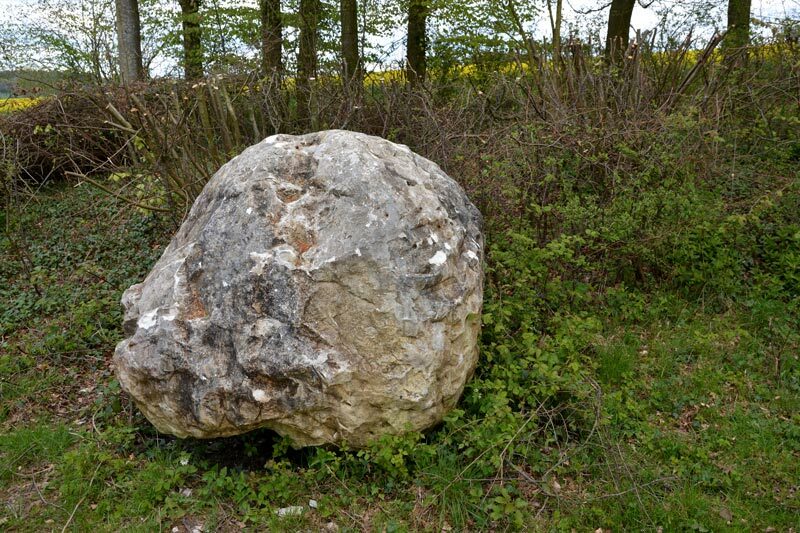 Stone 12 is one of the hardest to spot. Some trees have come down around the stone and it’s so weathered it almost blends into the side of the hill. The track now levels out and you’ll see the next stone (above) on your left. Keep going straight ahead. The track leads downhill past a Scout Camp on your right. 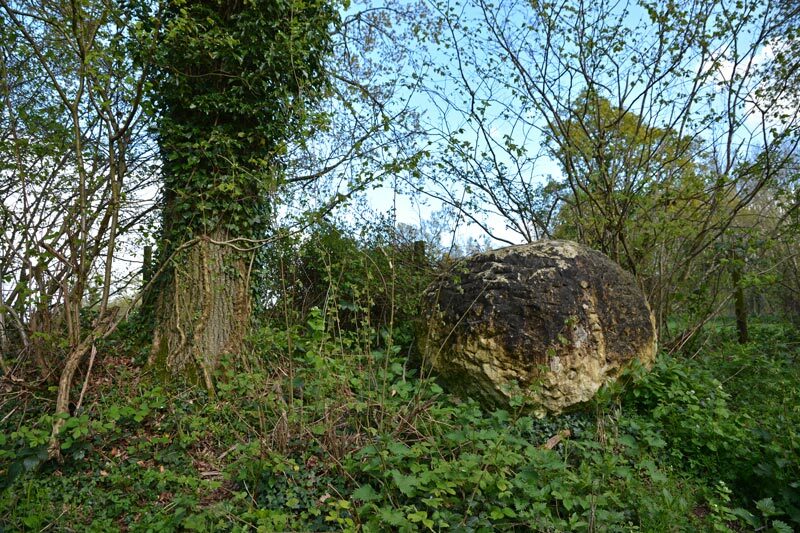 The last stone on the Chalk Stone Trail is beside the old railway line that used to run from Midhurst to Chichester. Carry on under the bridge and you’ll reach the road opposite the entrance to West Dean College. Turn right along the main road and you’ll soon be at West Dean with its pub and village shop. 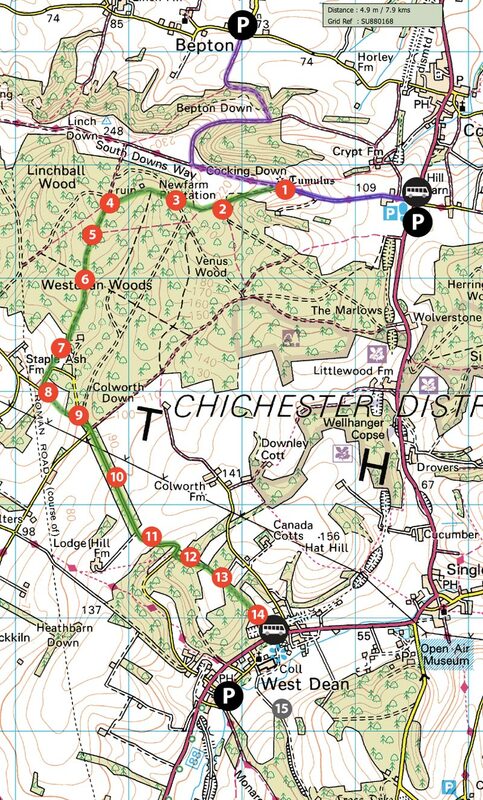 Here’s a map of The Chalk Stone Trail. Next Post Our Baby Froglet!